The names of some authors live forever, while others are lesser known or maybe even forgotten altogether by the wider public. William Hope Hodgson falls into the latter category. He isn’t completely unknown; to those who love strange stories he’s a giant as revered as, say, HP Lovecraft, but is unlikely to be familiar to laymen on the subject. But perhaps the latest entry into the British Library’s Tales of the Weird series will boost his profile. If you have heard of him, then it will perhaps be because of his novels The House on the Borderland and The Night Land, or arguably his most famous creation, the occult detective Thomas Carnacki. I’m a big fan of Carnacki and feel he’s as compelling a character as Sherlock Holmes and can’t understand why he isn’t as well known; incidentally, he did make a TV appearance, played by former Yorkshire resident Donald Pleasence in an adaptation of The Horse of the Invisible, which was made as part of the ‘Rivals of Sherlock Holmes’ series in the 1970s. 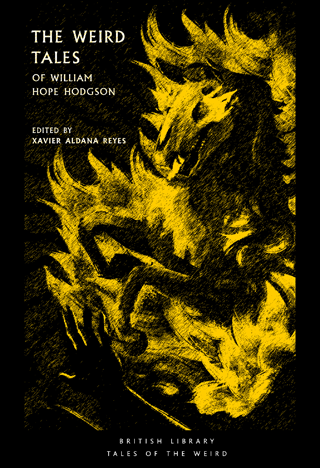 This collection contains a selection of Hodgson’s marine-based spooky tales as well as classics featuring Carnacki (including the aforementioned Horse of the Invisible), collected in chronological order. When included in an anthology containing other writers, the author’s work tends to stand head and shoulders above the rest, but as is often the case, when read back-to-back, certain themes tend to appear time and again, making them somewhat repetitive. For me, the Carnacki stories are superior and less samey, and act as a good introduction to the character; cheap editions containing accounts of his adventures are available for those who want more. To be honest, Hodgson himself is arguably even more interesting than the characters he created. He was born in Essex in 1877 and ran away from boarding school at 13 to go to sea (which perhaps inspired some of his later work). Short in stature, he grew tired of being bullied by his older, larger colleagues, so became a bodybuilder and became so good at it that he opened his own School of Physical Culture in Blackburn. However, when it failed, he took up writing fiction, a career that came to an abrupt end when, at the age of 40, he was killed at Ypres in 1918. If any film-maker is looking for an intriguing subject for a biopic, Hodgson would certainly fit the bill, but for now, fans and newcomers alike will have to make do with this decent introduction to his literary career.